I have more guilty pleasures than any mere mortal should have. One of them is (are?) Charlie Chan movies. They are laced with ethnic stereotypes, broad humor and Scandinavians playing Asians but, lord help me, I love them. 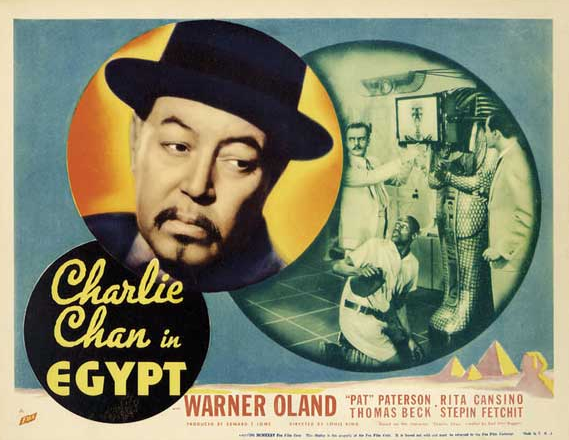 I recently watchedCharlie Chan in Egypt for the first time in many years. It is simultaneously good and campy. It features an Egyptian dude who calls everyone “effendi,” the fortune cookie wisdom of Warner Oland as Charlie Chan and the antics of Lincoln Perry aka Stepin Fetchit. The story is swell but every time Oland and Perry were onscreen together I started riffing about duelling ethnic stereotypes: the positive versus the negative. I suspect you can figure our which is which. ahh, number 2 son. birmingham brown. endless charlie chan movies as a kid.i snagged an old charlie chan book at an estate sale. topper, the thin man. abbot + costello. one of the few DVDs i’d watch over. I love the Charlie Chan movies, but it’s been ages since I’ve seen one. Time to remedy that.